[Because Kerri Walsh Jennings wore kinesiotape at the Beijing Olympics] "That's why it's popular, Not because there's good science behind it." "Kinesio Tape" or "Kinesio Tex" tape was developed by Kenzo Kase, a US trained chiropractor and acupuncturist, in 1979 with the first published book in 1982. Lance Armstrong mentions kinesiotape in his book, "Every Second Counts”, and how it seemingly makes pain go away magically. Kerri Walsh probably made kinesiotape most famous with her use in the 2008 Beijing Olympics. There are many applications for kinesiotape with the appropriate part and only certain specific functions depending on the area. Anyone can use kinesiotape by themselves with simple applications and I encourage people to learn how to tape themselves with their specific problem with professional supervision. I mention a more limited effective applications because it is highly dependant on the knowledge of anatomy and function. The best and most effective applications are easily post-treatment ankle sprains and shoulder pain support in my experience. I would not say TMJ applications are the best example simply because half the TMJ muscles are internal and most people will not wear kinesiotape on their face out in public. Areas like the knee are still fairly effective except the muscles around the hip are the primary knee stabilizers and friction from clothing slowly removes the tape with leg applications. The main difference with traditional athletic taping is that kinesiotape is flexible and elastic when compared to the rigid athletic tape. This inherently does provide less support but it is still as valid as the traditional athletic tape applications. 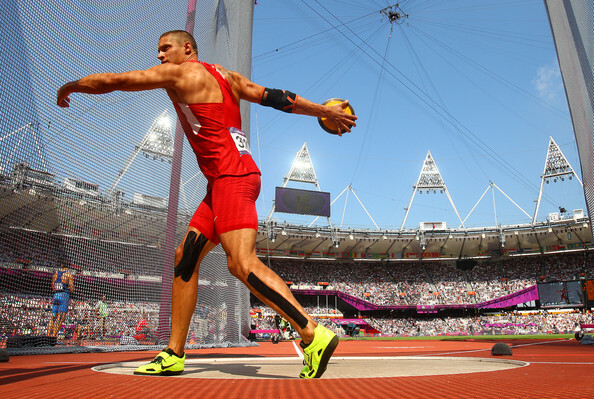 One could argue that the increase range of motion is more important for athletes who need proper motion and not something as restrictive as a brace-like tape. So there is elastic support and this can also be use as in compression applications like lymphedema or poor circulation of fluids in a local area. It is my personal opinion that kinesiotape can also function very much like the body's fascia, tendon and ligamentous structure support more than rigid athletic tape because many professionals use kinesiotape along the path of the muscle crossing over the joint and kinesiotape is able to cover a larger area of body with enough efficacy. A rigid athletic tape is usually only around the joint and acts more like a brace or should I even say more like a cast. 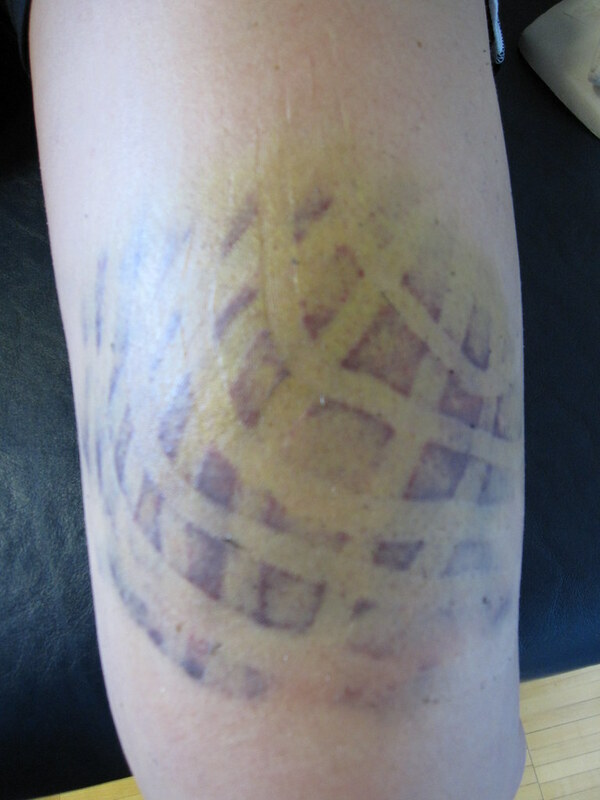 At first, I did not believe that kinesiotape helps with circulation when I heard it at a KT seminar. Here is photo proof of this and I have seen it for myself with patients. 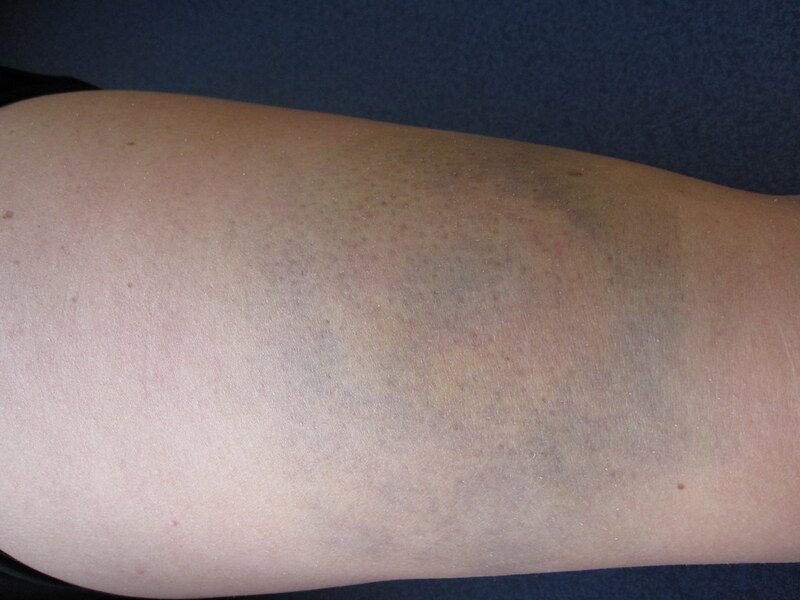 Search using Google yourself for "kinesiotape bruise". This is definitely not a placebo effect. If you read the skeptical articles carefully, you will see that people use it because it helps with their pain. I cannot say why these athletes say that it helps with pain without knowing their specific details. I do not believe, however, that kinesiotape helps pain by lifting the skin when myofascial pain is caused by inflammed muscles, tendons and ligaments. 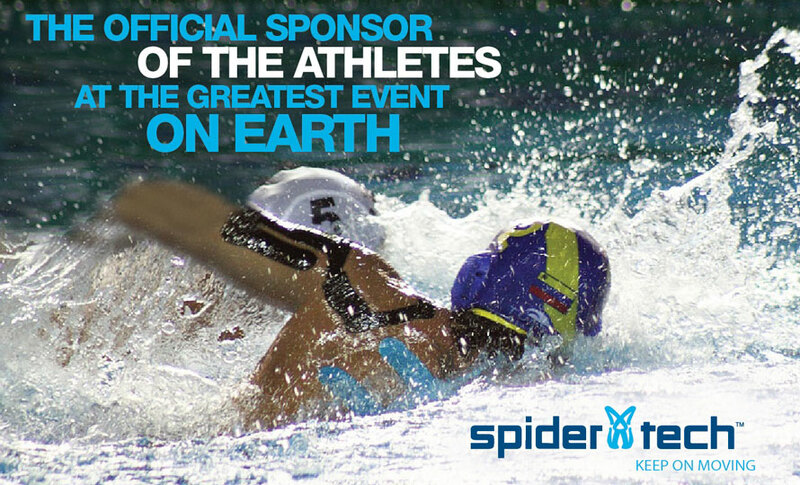 I do not believe that lymphatic drainage is the primary effect on pain with Olympic athletes. 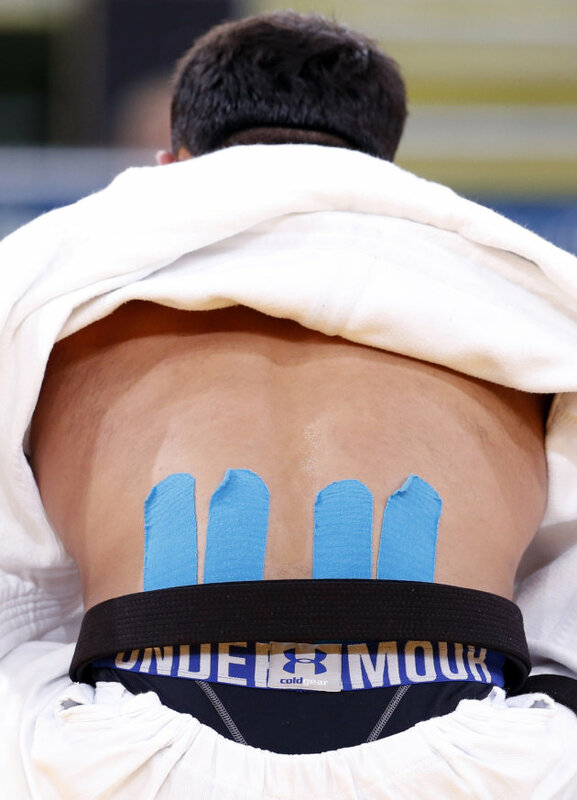 I also do not believe that kinesiotape makes athletes magically stronger but I do believe it allows them to perform to their personal maximum strength when the ergonomic form is correct and there is less pain distraction or fear avoidance. 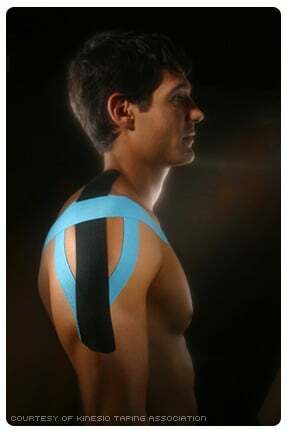 Kinesiotape is only a tool that has a specific role in rehabilitation. It is not the cure to pain by itself but it may help with minor pain levels until the next treatment session by reinforcing proper muscle function. I explain to patients that not only gives some elastic support but it pulls on your skin to give you feedback and provide a reminder to promote correct muscle action. 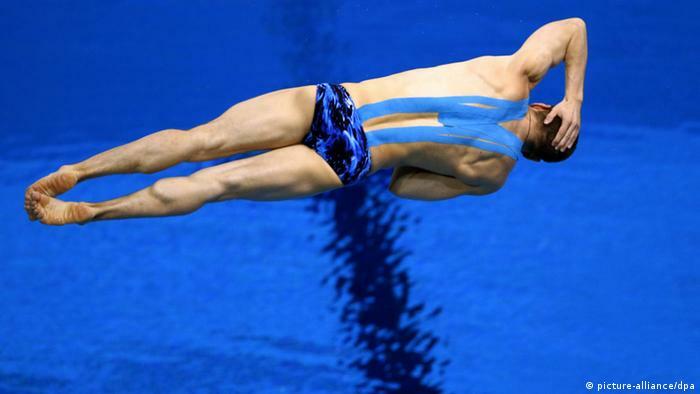 Kinesiotape cannot work if the person ignores the minor elastic pull on the skin and anyone can overpower the elasticity of the tape. 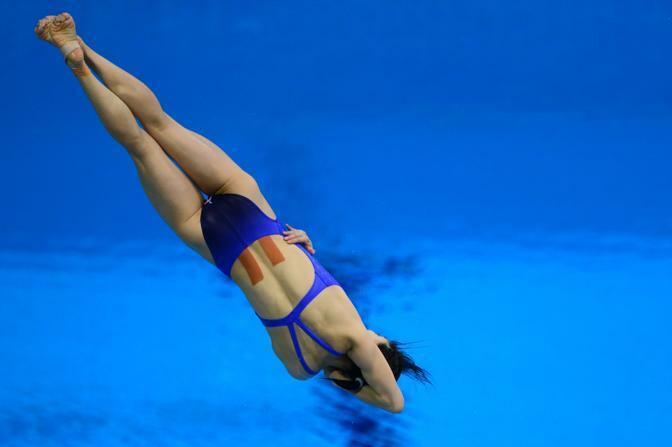 In other words, kinesiotape provides proprioceptive feedback or enhances the person's awareness of their body in space. This is not a placebo effect although proprioception happens inside the brain. "Athletic tape is static, but kinesio tape is flexible, so it can provide support without impeding movement." 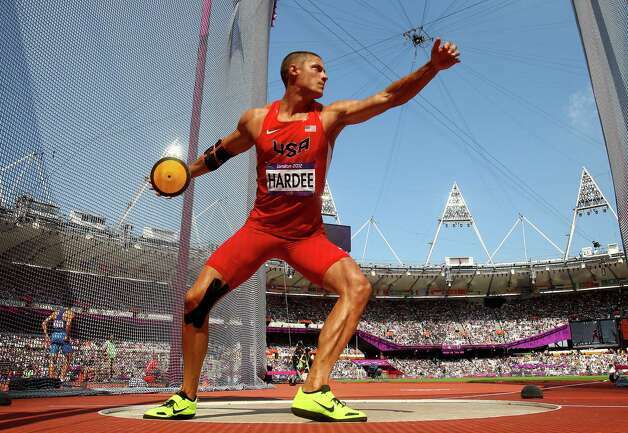 "This is one of those Band-Aid kind of things; it will allow [athletes] to do their physical therapy to get back to their athletic activities more quickly.[...] I think the company advertises it as more of a cure, but I see it as more of an aid. 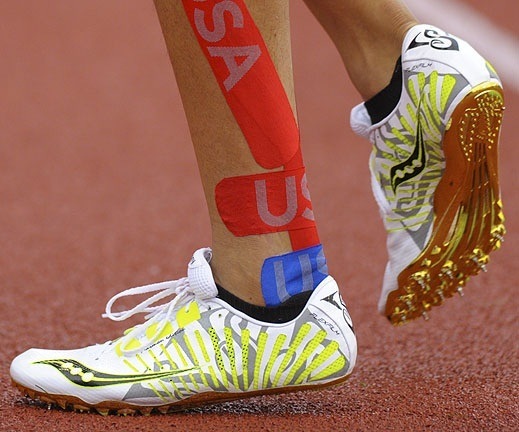 If things like Kinesio tape can aid rehab, then that's great, that's one of our goals." SM Vol 42 #2 is a very critical article but I do not see where medical doctors and researchers say there there is absolutely no scientific benefits in the previous summary and it is purely a placebo effect. As a side point, the research in SM Vol 42 #2 says that there is no difference between KT and other elastic tape and I have no problem with any decent kinesiotape brand. A study in the Journal of Orthopaedic & Sports Physical Therapy July 2008 Volume 38 #7 showed that the application of kinesiotape showed a clear relationship with pain when applied correctly and an immediate effect on pain occurred. Over time, it did not fix the underlying issues of shoulder pain which makes sense. This is where myofascial (massage) therapy, corrective exercises, etc. would be needed. In the next summary of a research experiment, I would theorize that being more aware of a body part allows for better neurological stimulation and ultimately better muscle firing but this is just a personal opinion. 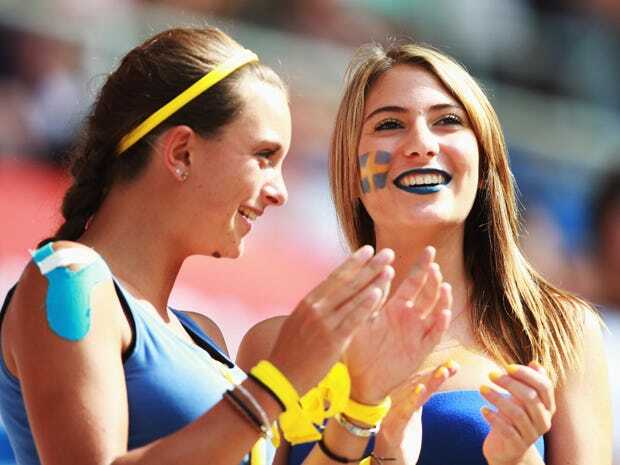 There also maybe a plyometric effect. One just needs to design a better experiment and study the elements of the benefits of KT to appreciate its place in sports therapy as one of many tools. Saying that there is little or no evidence in research for its efficacy does not necessarily mean that something does not work. Perhaps, these scientists need to understand kinesiotape better by try being in the shoes of these athletes. It does not help when the people who do see benefits cannot effectly explain why it helps either. A pet peeve of mine is to do a scientific study using participants with a lack of experience like making conclusions on the efficacy of chiropractic adjustments with no chiropractors doing the adjustments. Sometimes, the theoretical world and the real world are different. To believe any one person or field understands the many complexities of the body, is pure arrogance. I also wonder if Kenzo Kase's background as a chiropractor / acupuncturist has anything to do with the lack of acceptance. It truly is not a chiropractic product even though chiropractors have used these products for years now. I can understand a healthy skepticism with the many health fads out there but there are many things in my practice with chiropractic and Graston Technique that have little scientific evidence. Unfortunately, when it comes to pain, there is little profit unless there is no pharmaceutical drug involved so there is little money allocated to this research. I myself constantly think about things, test and retest to constantly improve my understanding and clinical results. *If there is an image that you would like to be removed or there is a mistake in any credits, feel free to contact me and it will be done as soon as possible.